Making the decision to outsource your current in-house grounds maintenance crew can be difficult, especially if they have worked on your property for several years. The timing may not seem right to broach the subject with your employees, but the timing is right to start making your grounds appear fresh and professional. When people come to your property, you want them to have a positive first impression by seeing neatly edged sidewalks, pruned plants, and flower beds free of weeds. The in-house crew may miss these areas due to negligence, focusing on other areas of the property, or simply because they were being asked to complete a different task. The in-house crew has been a part of your company for so long, people rely on them to complete tasks that are not landscape related. Setting up for events or performing inside repairs end up being a part of their job description. The crew is pulled in so many different directions that the task of making the grounds look attractive can fall to the wayside. By hiring an outside company to perform your grounds maintenance services, you can allow your maintenance staff to focus on building upkeep and inside projects. While the grounds crew members may have individual skills to bring to the position, their ideas may not always mesh into creating an outdoor grounds master plan. They build their own culture and are set in their ways of how to maintain the grounds. This does not bode well for keeping a cohesive and professional look to your property. 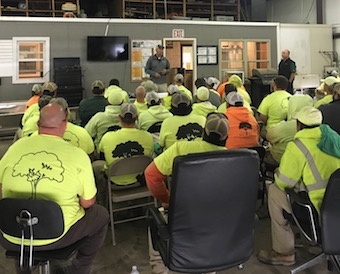 With a commercial landscaping company, each employee is trained by professionals in the same way, resulting in transparent and organized processes to keep your grounds looking their best. Turfscape, for example, trains each employee on the crews for pruning, lawn mowing, property enhancements, and snow removal. Keeping your in-house grounds crew can become a pricey decision. The cost of owning, repairing, fueling, and storing your equipment adds up quickly; as does the payroll, insurance, and benefits package for your employees. Without professional advice, choosing the correct equipment to complete a job not only creates a managerial nightmare, but can result in the wrong tools being used outside, making the grounds appear unkempt. Turfscape can help you sell your equipment, may even hire some of your current employees and ensure beautiful grounds maintained efficiently and effectively. The benefits of hiring a professional go beyond making a positive first impression with your property; they give you peace of mind. Their sole focus is the landscaping of your property. They are continually striving to maintain attractive and healthy grounds along with suggesting improvements to prevent an outdated look. You can trust them to be there when they say they will because your partnership is important to them. So, if you are wondering if this is the right time to outsource your grounds maintenance services, review these points in relation to your in-house crew. Turfscape is willing to speak with you about any concerns or questions you may have about switching to a professional.